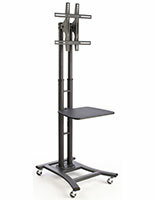 These flat panel mobile TV stands are the best options for advertising, marketing, and displaying information. 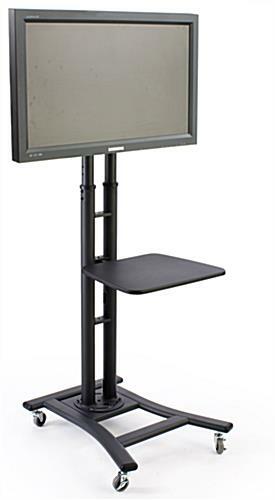 The widescreen monitor racks easily showcase digital presentations and digital presentations at tradeshows, transportation centers, lobbies, hospitals, and many other establishments. 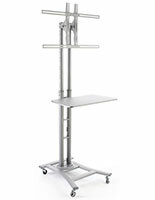 These 4-wheeled mobile TV stands, also referred to as portable LCD floor displays, come with an adjustable height shelving unit to best accommodate electronic devices and accessories. The sturdy aluminum monitor trolleys have a black exterior to offer a neutral coloring that blends well with most decor. 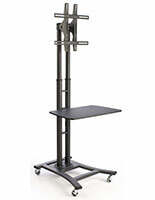 These commercial-grade TV stands are capable of presenting the screens at eight different height presets ranging from 44" to 81", to ensure audiences can see the ads in any environment. These widescreen TV stands includes four wheels at the base that will lock into position when necessary for maximum stability. 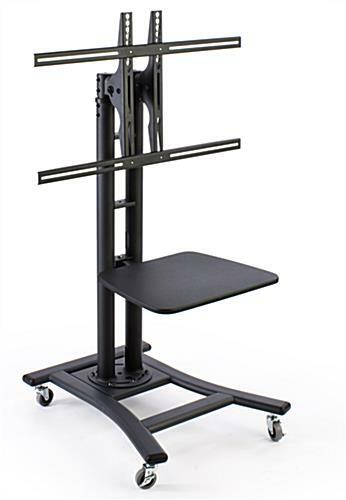 The VESA-compatible mounting bracket allows screens to tilt up to 15° downward for visibility, making this model a great choice for training environments in healthcare as well as other professional offices. 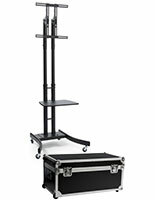 The AV cart is designed for 37" through 65" screens weighing less than 110 pounds to secure many different models. These neutral finish rolling displays easily accommodate digital advertising, sales and marketing presentations, as well as being a great choice for distance or group learning. Each commercial mobile TV stand, similar to an AV cart, has an aluminum metal fabrication that is strong enough to endure heavy daily use. 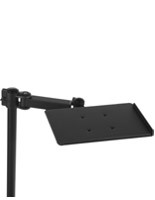 The widescreen television bracket includes all of the necessary hardware for mounting most screens, but there are some televisions that may need different screws that are easily available at hardware stores. This black finish mobile TV stand for promotional displays is shipped completely unassembled to lower costs but comes with an instruction manual to make for speedy set-ups. This portable stand for digital advertising or presentations is popular in medical facilities for training or shared workstation use. 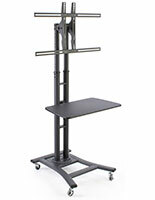 The adjustable shelf is the ideal space for taking notes on what is on screen. The sturdy monitor trolley offers built-in cord management for a tidy, organized appearance in any environment.